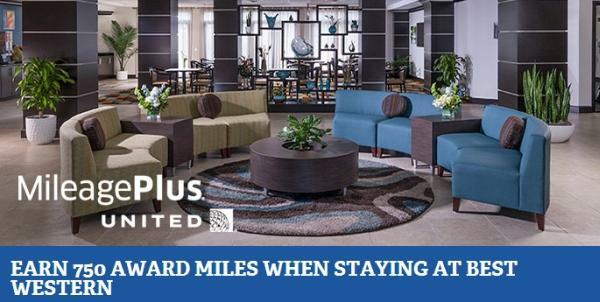 Best Western Rewards has a new promotion for United Mileage Plus members that can earn 750 miles per stay (250 base + 500 bonus) between September 10 and November 19, 2013. Best Western Reward will also upgrade your status to Gold. You can access and register for this offer on Best Western’s website here. This offer is valid for Best Western Rewards members in the United States and Canada. There seems to be few airline related bonus offers this fall. Let’s see if there is a promotion for Best Western Rewards points as well. New and existing Best Western Rewards® members (“Member(s)”) who: (a) reside in the United States or Canada; (b) register for the Promotion; (c) have chosen United Airlines as their Best Western Rewards earning preference; and (d) complete a qualified stay* at any Best Western branded hotel worldwide between September 10, 2013 and November 19, 2013 (“Promotion Period”), will be awarded 500 bonus MileagePlus® award miles per qualified stay. This is in addition to the standard 250 MileagePlus miles awarded per qualified stay. In addition, the Member will be automatically upgraded to Gold Elite status upon completing the first qualified stay. There is no limit on the number of bonus MileagePlus miles a Member may earn. REQUIRED PRIOR TO THE FIRST QUALIFIED STAY. *A “qualified stay” for the purpose of this Promotion is defined as one or more consecutive nights at the same Best Western branded hotel at a rate eligible for earning points or airline/partner rewards through Best Western Rewards. Qualified stays that take place during the Promotion Period, but which have a check-in or a check-out date that overlaps the beginning or the ending dates of the Promotion Period, will be counted towards the Promotion. Offer not valid with any other promotion or discount. Promotion is subject to cancellation or change without notice. Allow 6-8 weeks from completed qualified stay for posting of bonus MileagePlus miles and upgrading to Gold Elite status. All Best Western Rewards Program rules apply. See www.bestwesternrewards.com for additional terms and conditions. Each Best Western® branded hotel is independently owned and operated. Best Western and the Best Western marks are service marks or registered service marks of Best Western International, Inc. ©2013Best Western International, Inc. All rightsreserved.